LINK If he's there in the second round do we grab him? I’d love to but ACL injuries are so common now I think some team will still nab him late first round. Or early second. Wouldn't surprise me if he could make it back by middle of next season. I think you have to draft even with the Drew Brees window closing. Late 2nd for a top 10-15 talent? Even if he had to sit out the whole year which isn’t likely, I still take him. Cleveland the new Cincinnati now that Lewis is gone. random mock on twitter, funny cause has him going to our 30th pick. I just wonder if the Saints have taken him off their board because of the incident. From what I can tell, it was out of character or he has matured into a good kid. But the Saints staff are big on high character guys now. I don’t know if he still has character concerns or not but if not, Saints would have to take him. We might can take him with our 1st round compensation pick at the end of the round that Goodell needs to fork over to the Saints. This board went nuts with Peat as a project, then lost their minds with Davenport as a late year starter. Would be glorious to see us use our 1 pick in the 1st 3 rounds for a guy that won’t play at all in 2019. No he won’t. And I agree with Les. Don’t even get our hopes up. Someone in a rebuild like the Raiders or Dolphins will take him way before us. If they don’t some other team will. If he hadn’t had that injury he was going in the top 10-12. Still, this is a deep draft in some positions. There could be a really good player fall to us. 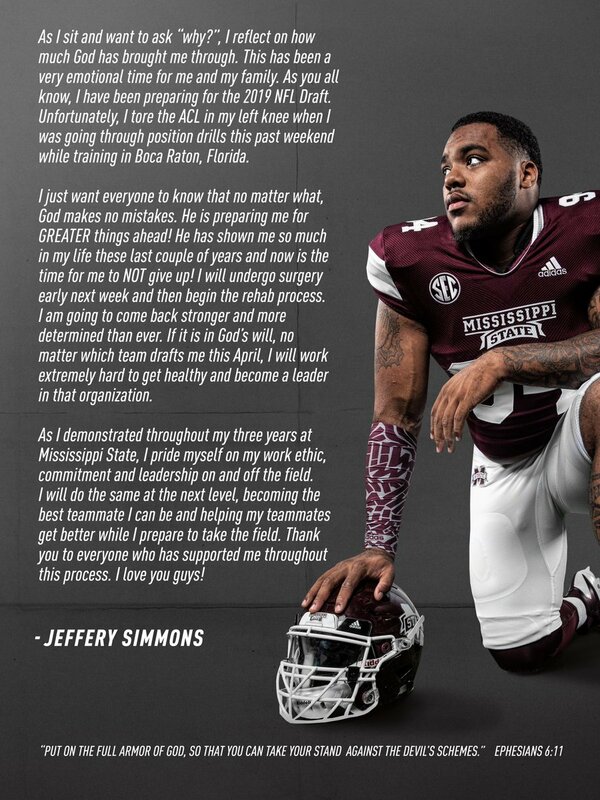 I just don’t think that player will be Simmons. It'll be someone with multiple first rd picks picking toward the end of the round.